A major row between the heads of two of the South Pacific’s foremost journalism schools threatens to spill over into a wider arena and damage regional relationships. The director of the influential Pacific Media Centre at the Auckland University of Technology, Professor David Robie, has accused the head of the School of Journalism at the Fiji-based University of the South Pacific, Canadian Dr Marc Edge, of “raising doubts about the integrity of the AUT” when he criticised the post-graduate thesis of a former Fiji newspaper publisher, Thakur Ranjit Singh. The thesis – supervised by Professor Robie – had been strongly critical of the reporting of the country’s oldest newspaper, the Fiji Times, in the lead-up to the Fiji coups of 2000 and 2006. In a letter to the Fiji Sun, Dr Edge accused Mr Singh – a former publisher of the Fiji Post– of being “biased and “one-sided” and described him as “self-serving”. He questioned the basis of Mr Singh’s thesis, saying that while he found it “interesting”, he did not feel that it qualified as a work of scholarship. “His bias is not only obvious from the outset, it is even explicitly stated”, Dr Edge said. Mr Singh had tackled Dr Edge over his support for western-style media freedom in Fiji in an article in the Sun that Dr Edge described as an “insulting” personal attack. In a letter of response, Professor Robie said that he was “surprised and disappointed” by Dr Edge’s criticism, which he described as “unfair” and “incorrect and inappropriate for an educator”. Professor Robie cast it as a slur by the USP journalism head against the AUT. 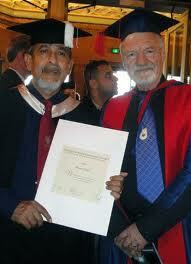 “Mr Singh was examined robustly by three external examiners with expert knowledge of Fiji media and coups”, he said. Describing the work as “significant”, Professor Robie accused Dr Edge of raising “doubts about the integrity of AUT” that were “unacceptable and totally unsupportable”. The controversy comes within days of a furor in Fiji over an attack by Dr Edge on the Pacific Islands News Association, PINA, the umbrella group for the region’s media. 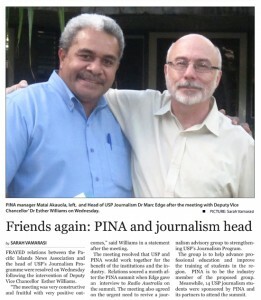 In an interview with Radio Australia a month after PINA delegates gathered in Fiji for its 2012 summit, the USP journalism head accused the organisers of trying to “keep a lid on dissention” at the summit venue over threats to media freedom since the 2006 Fiji coup. This was strongly denied by the head of PINA’s secretariat, Matai Akauola, who said he was “appalled” by Dr Edge’s comments. Grubsheet has obtained private correspondence, detailed below, that throws new light on the row and indicates both the resulting damage to relationships between the USP and PINA and the wider regional fallout. This includes a warning by Margalie Tingal -a Kanak journalist from New Caledonia who has been training at USP – that Kanaks may abandon the university and resume their training programs in France. A senior regional educator, who asked not to be named, told Grubsheet that the New Caledonian government – of which the Kanak independence movement, the FLNKS, is part – was “keeping a watchful brief” on USP. “They want to build strong English-speaking ties around the Pacific and media skills among their Radio Djiido team, which is now the top local broadcaster. If they feel they are being short-changed at USP, they will look elsewhere around the region for an alternative”, the educator said. After Dr Edge’s public criticism of the PINA organisers on Radio Australia, he sent a letter to Matai Akauola repeating that criticism and accusing PINA of organising “propaganda” sessions at the Fiji summit and deliberately avoiding discussions about media freedom. He cited a session on non-communicable diseases as an example of this, sparking outrage when these diseases are demonstrably a major feature of island life. In comments that caused further anger and dismay within PINA, Dr Edge threatened to withdraw the USP from the organisation and join a breakaway group of mainly Polynesian journalists – the Pacific Media Association, PasiMA. Grubsheet understands that a strong protest was lodged by Mr Akauola with the USP hierarchy over Dr Edge’s statements. The Fiji Government is also said to have been concerned at the wider implications for regional unity of the USP siding with the largely Polynesian PasiMA over the strongly Melanesian-backed PINA. The USP is financed and supported by a range of regional governments and is a specific expression of Pacific unity as the region’s preeminent seat of learning. The USP’s response was to host a meeting last Wednesday between Matai Akaoula and Marc Edge in the office of the USP’s deputy Vice Chancellor, Dr Esther Williams. Dr Williams is understood to have made plain the USP’s support for PINA in a meeting characterised by one source as the USP telling Dr Edge “to pull his head in”. Certainly, there appears to have been a concerted attempt to defuse the row. The two men resolved to “work together for the benefit of the institutions and the industry”. The university’s student newspaper, Wansolwara, subsequently carried a story trumpeting that Dr Edge and Mr Akauola were “friends again”. It was accompanied by a photograph of the two with their arms around each other. This in itself has generated fresh controversy, with one critic describing it to Grubsheet as a “sickening” exercise in news manipulation by a paper intended to be a training ground for the region’s journalists. “I find it all quite shocking, when only a short while ago, Dr Edge was accusing PINA of propaganda that he is now displaying it in his own student newspaper”, the source said. 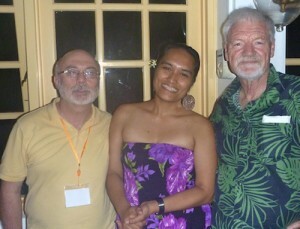 Dr Edge has described Professor Robie on his own website as “perhaps the foremost world expert on the Pacific media”. But the two men have taken up opposing positions on the question of how journalists working in developing countries should practice their craft. Professor Robie is a strong advocate of what he calls “peace journalism”or “development journalism”, a less confrontational paradigm than what he calls the “Western conflict model” practiced in the surrounding metropolitan markets. Dr Edge, on the other hand, has criticised peace journalism, urging journalists in Fiji to press for the western model and tackle the government head on. “I just don’t agree that the development journalism model would be the best one for Fiji. I would prefer to see a free press here to shine a light on powerful groups and people in society and thus help guard against corruption”, he said. In his letter to the Fiji Sun, Professor Robie said Dr Edge was entitled to his views but “they revealed a Western mindset that encourages conflict reporting and ignores the challenges and responsibilities of the media in developing countries such as the Pacific island states”. Clarifying his comments later to Grubsheet, Professor Robie denied that he opposed a free media in Fiji, saying he had campaigned for a free press in the Pacific for more than two decades. “Any suggestion that I believe in non-confrontational journalism and toeing the line is not the case. But I do advocate a much higher level of contextual journalism and strongly believe that the media should not just be divisive but work towards political and social solutions”, he said. To follow are the leaked email exchanges, first a letter of complaint from PINA’s Matai Akauola to Marc Edge about his critical comments on Radio Australia, Dr Edge’s response and a letter of protest from Kanak USP student Magalie Tingal. I am appalled at your comments on Radio Australia. Well, you are entitled to your thoughts and I hope it is not that of USP. I hope you’ll be good enough to also have a read of a report from an independent report from Graham Davies. Sent: Friday, 27 April 2012 1:26 p.m.
I’m sorry if my comments came as a surprise to you. I had wanted to discuss my concerns with you personally, but you were very busy at PINA and I have been very busy ever since. Now that this is out in the open, I hope we can deal with it in a constructive manner. Of course, the views I expressed are my own and do not represent the university. But the university has brought me to Fiji as a result of my expertise in Journalism, so I hope it is at least an informed opinion. I guess we’re both appalled now, because that is exactly the way I felt after watching what went on at the Media Summit. It was embarrassing to hear panelists confess that they had no expertise to offer on the topic they were discussing. Looking at the list of sponsors, it was obvious to me that the only reason some of them were on the panel was because they had donated money. I am sure it is difficult to fill these panels, but I really do feel that PINA members deserve better. They also deserve better than to be just herded together as a captive audience and fed propaganda. BTW, I said “white” (or good) propaganda, not “right” propaganda as in the transcript you sent. I don’t know if you were there for my panel presentation, but I mentioned the incongruity of devoting two hours earlier that day to a session on NCDs and only 45 minutes to a session on important issues such as press freedom. There are more important issues than NCDs and sports, I noted, although you wouldn’t know it by looking at the programme. It was obvious to me that there was such a heavy emphasis on these issues due to the sponsorship of such groups as the Ministry of Health and the Olympic committee. This struck me as a bit of a sell-out, although I didn’t say that publicly and I would try to phrase it a bit more delicately, as I feel I did in my interview with Radio Australia. It would be more useful to discuss the role of the media in covering political issues, I said, because political issues will determine how problems such as NCDs are dealt with. But most concerning was the way issues were dealt with – or more specifically, not dealt with – at the AGM. Everything was decided behind closed doors, we were simply presented with a document, and there was no discussion of the issues. I had wanted to raise some of the points above, but you informed me that as an associate member USP has no vote. I have learned that it’s better to air issues out in the open rather than trying to sweep them under the carpet, especially in these days of new media, where they can be freely circulated on the blogs. They will not go away that easily. In light of PINA’s refusal to deal with important issues such as press freedom, I believe that USP will have to consider whether it wishes to remain a part of your group, especially if we are not allowed to have a voice. We will certainly be forging ties with PasiMA, which seems to take these issues more seriously. And we will certainly be dealing with them at our symposium on Media and Democracy in the South Pacific in September. From: magaly tingal Sent: Wednesday, 2 May 2012 10:27 a.m.
it took me all this time to reply cause I needed to update the board of my company back in NC before and it was hard for me to get in touch with all of them cause it was a long week end off at home. For those of you who don’t know me I’m Magalie TINGAL, student in the Journalism program at USP, I’m from New-Caledonia and I was one of the panelist at the PMS in march on the behalf of Radio Djiido, the radio station where I worked there since 2000. I’m the first student from NC with a scholarship from the Government of NC and it still difficult to adjust with the English system. Radio Djiido is a FULL member of PINA and coming to study at USP it a part of our new training policy, USP has been chosen as the training ground for our journalist for the future, cause we truly believe that USP is the most prominent University over the Region for us to get great skills and knowledge. The president of the Congress of New-Caledonia, Rock Wamytan came earlier this year to express to Mrs Williams our willingness to work with USP to open more doors to send students here in any program. Radio Djiido in it editorial line is for the Freedom of the Press and will fight for the rights of Journalists as far as we can. I think that Dr Marc Edge can make his own decision to stay or not in PINA but it’s sounds inappropriate for us who want to work with every Regional Organizations, everything it’s new for us cause before we mainly deal with France. I came here to learn, which it still hard for me as I still struggle with my English but that kind of comments and troubles between PINA and USP is not encouraging for me and furthermore for the next students from New-Caledonia. I believe that all of us want to have good trained journalists at the end of the day, then we need to work with everybody. Then please on the behalf of Radio Djiido and the sake of the next students that we planed to send here to study, can you sort it out, otherwise we may have to make a decision for our training. Who are these titans of Pacific academic journalism and what are their backgrounds? For Professor David Robie click here. For Dr Marc Edge click here. The debate continues with this letter to the Fiji Sun from Thakur Ranjit Singh calling for all parties to formulate a “Fiji model” for the local media to take into account its special circumstances. These two clowns are Pacific media titans? Yes, Terry, they train a large proportion of the journalists who eventually enter the mainstream media in the Pacific and set the standards for journalism in the region. So the collective quality of our media very much depends on them. They also dominate the debate about what kind of journalism best suits local conditions, David Robie champions the “peace” or “development” model and Marc Edge has suddenly emerged as the champion for a more “western-style” confrontational model, for Fiji at least. That makes it a clash of ideas between these two men. I’ve called them Pacific media titans as in people of great strength, intellect, or importance – the dictionary definition of titan. You’ve called them clowns, which is a very unusual way for the media advisor to the prime minister of Samoa to refer to two of the region’s most eminent media educators. Does Dr Edfe has any pacific experience? they just academics mate and the issues they deal with are largely academic..they’re not practicing journos in the region..they’re neither titans nor big movers in the regional media scene..
Terry, I don’t know about Marc Edge but it’s nonsense to say that David Robie is “just an academic” and “not a practicing journo in the region”. In fact, before he went into academia he was among the region’s pre-eminent journalists, covering the Asia Pacific for more than 20 years. He had a number of notable scoops for international outlets and has written two journalistic accounts of major stories in book form – the sinking of the Rainbow Warrior and the Kanak independence struggle in New Caledonia. How many books have you written, bro? David also edits the Pacific Journalism Review, which carries investigative pieces by his students. So even as an academic, he continues to practice journalism as a writer and editor. Why you would say otherwise is quite beyond me. But it’s pretty clear that your own knowledge of some of our journalist educators can be written on the back of a bar coaster. Me gots a question though, hehe, why is david robie pushing this peace journalism idea in the region? what is the perception of this peace journalism in New Zealand and Australia?..Every time I turn on the tv I see nz/aussie journos doorstopping politicians, gatestopping business folks, knock on people’s doors and stick microphones through windows..why should things be any different in islands? aren’t the evils still the same? corruption, misuse of funds, abuse of public resources, etc, er, unelected military dictators..
USP is a great University and has trained so many people who have gone on to be great people Pacific wide. I hope that you reconsider your opinion about the insitute and that hopefully the next Lot of students will be able to have the opportunity to experience the diversity here at USP. It is really a great place and I understand that with all this media hype between these two Pacific media titans as so put, people have forgotten the students and the effect that this row is having on them. Having been assailed on more than one occasion by Ranjit Singh for my race, I’ve long grown immune to the unfortunate personality based insults that pass as debate in Pacific journalism these days. But I do think there is a very important issue in the nature of journalism training taking place. Frankly I cannot see much difference in peace journalism to that of straight PR for assorted Pacific Governments, but equally I am not sure where the “Western model” is taking any of us… News media around the world is in a desperate struggle for survival; perhaps in 20 years all will be different and new models worked out. I am no soothsayer, but I doubt the new model will have an resemblance to the debate we are seeing here… My real concern though with USP and AUT is that it is selling to its students – peace v western – something it cannot deliver on anyway. Precious few of these graduates are getting jobs, and from personal knowledge, many of them find other work – mainly in PR – somewhat disillusioned by what they were sold back at school… It is no reflection on the personalities involved and those getting the top awards at USP or AUT, but the fact is few of them become working journos… Sad, I know, and pehaps we should really be having that conversation…? Welcome Michael. Yes, the inexorable rise of PR is a real concern and a global phenomenon. In Australia last year for the first time, more media graduates went into PR than into journalism. The point was made at the recent PINA summit that the same thing is happening in Fiji because of the low rates of pay for journalists. Ergo, the corporate spin doctors trying to influence news coverage are often a lot more talented than those “hacks” whose job it is to separate the wood from the trees. I was interested and not a little disappointed to see that one of Fiji’s best journalists, Stanley Simpson, recently left the job of news director at the FBC to work for Newcrest Mining on the Namosi project. A sad loss but who can blame him when, for undoubtedly the first time in his career, he can turn a healthy buck for his skills.